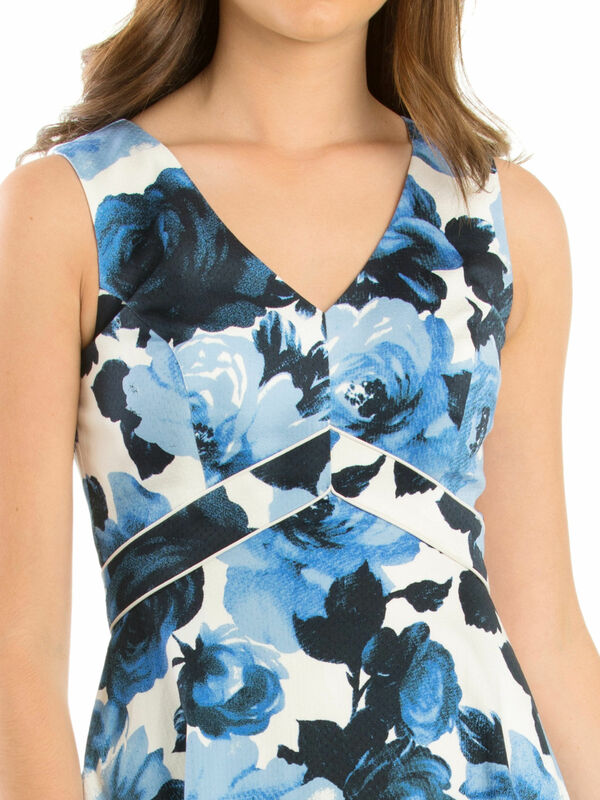 Miley Blue Rose Dress https://www.review-australia.com/au/miley-blue-rose-dress-blue/RE19DR374.RECRM010.html Decorated with stunning florals, this Miley Blue Rose Dress has a flattering fit and flare cut and contrast white piping at the waist. The sleeveless design is offset by the low v-shaped neckline for a stunning finish. A hidden zip sits on the back and the skirt is fully lined and layered. Pair with white accessories for your next special occasion. Miley Blue Rose Dress is rated 4.8 out of 5 by 26. Rated 5 out of 5 by Vettispaghetti from Pretty, versatile fabric. Style with the inverted V under the braline is the most flattering if all, as this is where a woman is commonly the slimmest! Such a pretty Style! Love it!! Team I up with mist any colour heels and bag! What I love about REVIEW is itsa complete outfit, requiring very little jewelry, it's enough on its own. Rated 5 out of 5 by Deztraction from Another stunning dress - no pockets I do love that the make of the dresses here at Review, I find the quality a lot better than Alannah Hill. 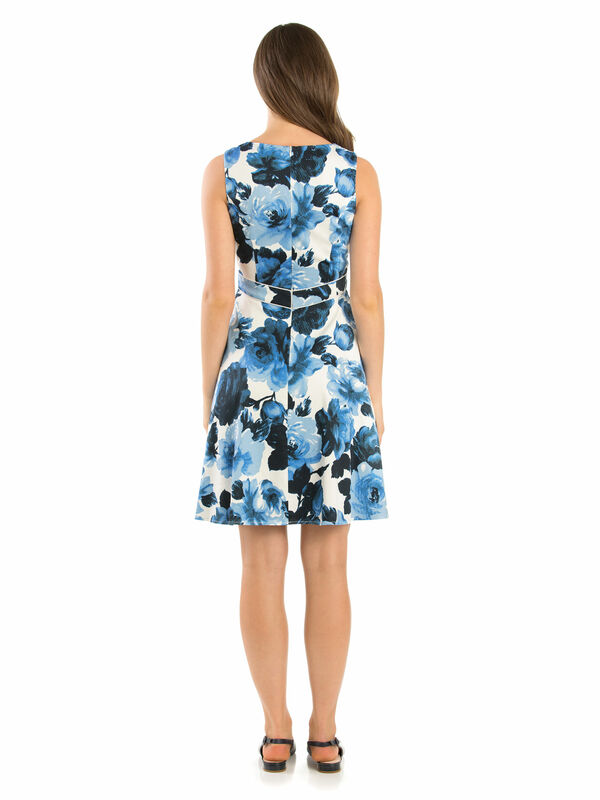 This dress is very flattering and the print is gorgeous. It goes very well the the cardigans too. My only negative feedback is it has no pockets and in my opinion everything should have pockets. Rated 5 out of 5 by SharonLK from Perfect for any occasion. This dress is true to size and very flattering. It can be dressed down for less formal events and dressed up for those times when you need to look a little bit fancier. Material is light enough for summer wear yet holds it shape elegantly. Floral design adds to the femininity of the cut. Just glorious! Rated 4 out of 5 by E286 from Stunning fit and so practical! I managed to pick this up the other week and it is a lovely fit and colour. So much more practical than a lot of Reviews recent offerings and I sincerely hope that there will be many more like this! My only slight issue was the lack of pockets, if it has them it would have been 5 stars from me! Rated 5 out of 5 by Maria from Stunning Colour and Style! I am in LOVE with this dress, it is beautifully fitted and the colour is standout. It looks so gorgeous on the body, very flattering in all the right places. I also love the low v shaped neckline, and the material is very good quality. What a Stunning Dress! Rated 5 out of 5 by Robyntob from Fit and flare cut I liked it on the model but when I got to store and saw it on the hanger I wasn't so sure. However the ladies in store explained it looks better on than it does on the hanger. I tried it on and they were right it just sat beautifully on me.